1. What is encaustic cement tiles? Secoin encaustic cement tiles are hand-made, aesthetic tiles with many colored patterns used for floor and wall coverings. 2. 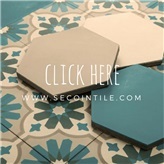 Is Secoin encaustic cement tile friendly to the environment? Secoin encaustic cement tiles are considered “green” products. They are manufactured from natural materials (cement, sand, stone powder, pigment) under pressing process. Unlike ceramic or clay-burnt tiles, no heat is involved, so there is no consumption of fuel; no clay is used, so there is no consumption of agricultural land. 3. Are the patterns on Secoin encaustic cement tiles painted? No, the patterns are not painted. Liquid coloured materials are hand-poured into mould divider to create these patterns. They are actually a layer of approx. 2mm. Therefore, the patterns will last very long and never go away. There are many ancient buildings in which encaustic cement tile floors have been existing for more than 100 years but still very beautiful. 4. How many colours do you have? Can I get my own colour? Secoin has a standard range of 50 colours for you to choose from. You can specify the colours you need by using our colour codes. Besides these 50 standard colours, any other colours can be customized at an additional cost and extra time. 5. Can you make customized designs? Yes, making customized designs is one of our advantages. At a small cost, you can have your own design which can make your floor differentiated from others’. We have been making a lot of customized tiles with patterns ranging from simple to extremely complicated. 6. I usually see white marks of the surface of normal cement tiles. What are those white marks? The white mark you see is efflorescence. On Secoin encaustic cement tiles, the white mark is considerably less than normal cement tiles. This is because we are using a special additive which has the function of reducing efflorescence and preventing water absorption. 7. Where can I use encaustic cement tiles? Can I use cement tiles outdoor? Do I need to seal the floor? When being laid in-door, there should be a sealer to protect the tiles from water and stains. When being laid out-door, tiles have to be protected by penetrating sealer that contains UV protection. This is to help preserve the colours of tiles from being faded when exposed to sunlight. We recommend you use penetrating sealers. There are various suppliers of sealers in your market. You can talk with the tilers to select the best sealer for your project. It is necessary that you make a test on a small area before coating the whole floor. 8. Will the floor be stained by soda, wine or acids? 9. Where should I not use cement tile? We do not recommend using it outdoors in places that freeze in winter. Care must be taken when using it in areas that will get wet and might cause a slip hazard. Cement and concrete tile is not made to withstand the weight of vehicles and therefore should not be used in driveways. 10. How do I maintain my hand made cement tiles?